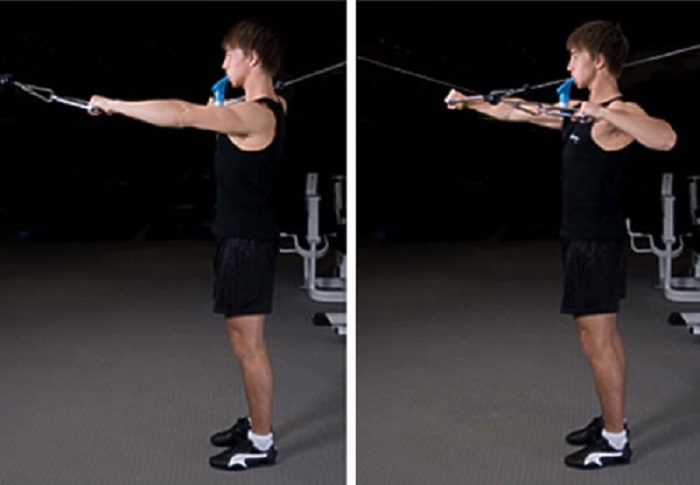 The Cable Push-Pull is a compound(multi-joint) movement and should be used by people who are at an early intermediate fitness level. Step 1: Set the cable system to the middle notch position so that the handles are approximately waist height high. Step 2: Grab one of the handles with each of your hands. Step 3: Rotate your body to the right so you are facing one of the pulleys and your back is facing the other. Step your left foot slightly forward, so it is one to two feet in front of your right foot. Step 4: Pull your left arm towards your body while pushing your right arm out at the same time. Step 5: Slowly return both arms to the starting position. You have now completed one repetition. Repeat for the selected number you have chosen. Step 6: Now turn your body the opposite way so that you are pulling with your left arm and pushing with the right. This exercise gets rated at an Intermediate difficulty level. You should have at least a few months of weightlifting under your belt before adding this lift to your training routine. To perform this exercise, you will need access to a cable pulley system. If you do not have access to a gym, you can still replicate the movement by using resistance bands and something stable to attach them to. The Primary muscles targeted are your Middle Back, Abdominals, and the Obliques. The Secondary muscles used with this exercise are your Deltoids, Chest, Triceps, Biceps and your forearms. This exercise can get used as an upper body aerobic or strength training exercise. To use this lift for your aerobic training, use a lightweight with few short breaks. For Strength Training you are going to load the weight so you can only complete 3 to 8 repetitions and take a minute break or longer between sets. Building a strong core reduces your chance of injury and has been shown to reduce and sometimes entirely remove lower back pain. You can burn a large number of calories in a short period when you include this exercise into a high interval training routine. This exercise is also a great way to add some additional muscle on to your frame. Compound movements like this allow you to strengthen multiple muscle groups at the same time. Training various muscle groups at the same time will enable you to more efficiently train and build your body while spending a shorter duration of time in the gym. Make sure that you keep your core tight while you are performing this exercise. Use a slow and controlled movement. It should take you one to two seconds to lift the weight and another one to two seconds to lower it. Set the cables anywhere between waist and head height. Play around with the height of the pulleys to find the most comfortable setting for your body. Breath out while you are lifting the weight and inhale when you are lowering it. We offer a free online HIIT timer you can use if you plan to work on your aerobic fitness. If you are looking to use this lift to increase your strength, watch out for our exercise logging software coming soon to track your progress. Building a strong core will help you to increase the weight you can move on many different lifts and helps bulletproof you back and limit your chance of injury in your daily tasks. If you have never done the Gorilla Chin Crunch before, try adding this lift to your routine for at least a few months to see for yourself all the benefits it has to offer.